Love the green…love the pants…the boots….love her! We need more Garance! What interesting lives…living for dressing up :).. I love the hat, the braid, the hoodie, the coat and the light! Perfect light and outfit! LOVE IT! I noticed I’m loving oversized coats more and more! Oh my god Garance! Get it woman! You have conquered the eternal beanie dilemma and also incorporated alot of your staples into this outfit! Big coat, sporty hoodie, funky fresh pants in a classic tailored look! Might I add that your hair is not in a bun! I always love how Garance looks, with the oversized coat and the wooly cap. She has great style. She’s so lovely. The hat looks great on her. I love the way she mixes different styles and clothes, her coat is so versatile! Never in my life would I have pictured Garance wearing a hoodie! Really cool! But I have to notice – flashing ankles and bare hands, when it’s 10 degrees?! Personally, I think this takes away from the coolness a bit, because there is no way she is not cold this way. I have to agree with the comment above and below. There’s something awful when one of your fashion idols puts fashion so far ahead of comfort (for the socks at least–you probably need bare hands to handle a camera no matter what the weather). So pretty and stylish, as usual! I love Garance, she’s awesome. Love her style! Especially the boots! Heaven’s giving her a big kiss you know.. I like the fact that Garance is a down the earth girl with tons of class!! I love her. Sensible yet stylish, I like this outfit! Garance is awesome. No doubt about that. But aren’t her ankles cold? It’s FREEZING here in central Illinois! There is no way that I could do the exposed ankle thing! 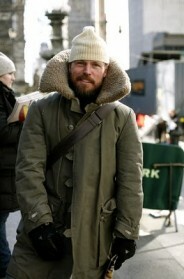 the main theme for dressing in NYC right now- keep warm! Again with the no socks in wintertime. What is up with you people, I will never understand. I love her look as usual! I agree with Margot. Frostbite is never in style. There are so many elements to love but, really, thank you Garance, for actually wearing a beanie all the way on your head! Some ladies wear beanies like they are afraid to mess up their bangs. Great vision on capturing the light and making her outfit and herself stand out at the moment, in that atmosphere! Love your work and how you interact with the environment! Great vision on capturing the light, her facial expression in order to make her outfit stand out!! Really love your work and the way you interact with the environment! Fantastic photo, the light on Garance’s face is magic. I have to wear socks. I even have slippers on in my house all the time. My feet get COLD! I love her hair. wow i see some bare skin on those legs, how brave!! i need to cover as much skin as possible in the conditions we’ve been having recently in the NE! My friend and I just started our site, because Garance is seriously our hero! We love her and you!!!! You guys are lucky! Tey looking that good in Montreal these days! (-30 with wind chill)…. Is this a picture of the outfit she was speaking about on her blog today? 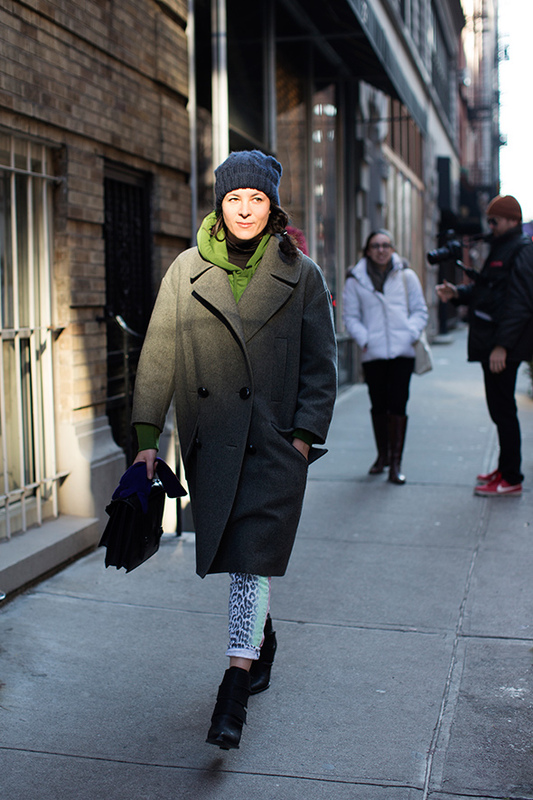 Love the light on Garance’s face … and how she manages to look stylish in cold weather. She needs to teach us parka-wearing Canadians a thing or two. Garance just made a post about looking cute in cold weather vs looking bundled – check it out. She’s so funny. I am tired of all of these “cold weather looks“ that are worn in places where the weather is doesn`t even dip below 0 (F). I would like to see some REAL cold weather looks coming from places where we have to find a way to dress for the weather. She does look great, though! I want to see her pants! But I echo the others, get those ankles covered up! shame on those pants… get her gloves and socks! Look at her!!! And yesterday she was taking about looking all bored with Winter clothes and fluffy coats!! She looks awesome! Ah Garance ALWAYS looks cool, even when it’s -12!! Loving the leopard print poking out of the jacket and the bare ankles! I remember reading her cold weather dressing post and I imagined her freezing in something barely stylish.But this is really good and cool and way to fight the cold! Her bare ankles are making me feel cold! Take it from a Canadian — feet (ankles), hands, neck, and head always need to be covered! Is the guy in the red tennis shoes juggling a camera? Yes! Is was the thing going on in the background with the camera that caught my eye!! Loving this look, the pop of green (where can I get that hoody?) with the other colors, the proportion of the boot with coat and skinny jeans. Not sure I could do the leopard jeans though. hahaha love that random peek of rainbow leopard print. wonderful way to bring the heat in the cold. Great photo, great coat and great light! Beautiful! Isn’t she beautiful?!! Love this pic!!! Your girlfriend is so stylish that she can inspire men’s and womenswear. Makes me jealous haha. Oh, I love the coat! I’m sorry Garance, I love you and you are gorgeous, but if it’s cold out, you HAVE TO COVER YOUR ANKLES!! You have no idea how much energy you are losing like that! Hugs from Finland! The sleeves on that coat hit at the perfect spot. Impeccable tailoring. What a great shot! Love the animal print pants. I was wondering if you purposely let her walk at that specific point(because of the lighting) or did you just captured the moment and surprising had this lightning? I’m not sure if you even answer to comments…This is a nice photograph. OOH, how I miss NYC. But hey, that is no way to dress for cold weather conditions! It’s time for long underwear, hooded parkas and michelin-man-type jackets. Why do people take such offense to exposed ankles? The comments on this and another photo remind me of my mother when I was in 7th grade and didn’t want to wear socks with my loafers. Yes! I was just noticing the flying camera in the background! Great moment in time. So cute! And I love the light across her face. This looks like it was cobbled together from the lost-and-found bin. 80s pants plus floppy coat and uncoordinated hoodie reminds me of my student daze when I had no money and no choice. Starving student chic? Garaaance! On voit un bout de peau et tu ne portes même pas de gants! Aaaaah! Has anyone noticed the guy in the background–what’s with the levitating camera? He wouldn’t be whipping it around…. Scott, what was he doing? That green coat looks like my mother’s 20 years ago and my mom gave it to me! The subtle animal print is lovely!